Our vision of equity of access to involvement, to public service, is built on the vision that is enacted in the continuing practice of ‘walking the patch’ by established MVPs/MSLCs (an activity which we encourage fledgling MVPs/MSLCs to begin as a ‘place to start work’). There is much still to do, of course. And, since I ask for clarity, let’s be clear why: power in maternity is with the labour ward matron, the obstetric lead, the community matron, the labour ward coordinator – and the further that ‘discussion’ about women’s experiences, and good practice, is away from the clinic and birthing room, the more purely aspirational it is. A national position statement shared with NHS England by National Maternity Voices (see below) in January included these points – the signatories, MSLC chairs and service user reps from around the country. Changing things depends on local MVP chairs and lead reps with a bit of status, in a public service framework (that frames their behaviour too), building and working local relationships. Among these local leaders in involvement there is experience of offering informal advice locally to senior maternity professionals – obstetricians as well as midwives – as well as commissioners, on the basis of earned respect. Acting as a sounding board at times, or providing contacts, to help with exploring quality improvement ideas, including associated engagement and involvement work. I came into maternity work as a woman with a baby in her arms. I stayed to become a long -time mslc rep, a maternity advocate who became an antenatal teacher, a NICE lay member, an LSA auditor, an RCOG lay co-assessor, and a NICE Fellow, along the way. It isn’t always fashionable for service users to say so, but in the MVP/MSLC movement we know the territory: the immediate experience last week, and the long view. MSLCs have not always been popular, even when effective, possibly because effective. I see and experience this movement as values-based: woman-centred and family focused. Recognising the human rights issues in birth. Respecting professional expertise. Evidence-based in approach to service design and information-provision. Valuing questions and debate. Women, professionals and commissioners together – it is an idea with such potential. I think Bill Kirkup and his team recognised the value of this idea when they made recommendation 13 of the Morecambe Bay Report, that the local MSLC should monitor complaints as part of strengthening involvement locally – well-developed MSLCs review complaint numbers and anonymised complaints at their formal meetings. I think also of recommendation 1.1.17 of NICE CG190. Governance involving women as service users surely is something on which commissioners – whether at STP level or in CCGs – need clear guidance. When Julia Cumberlege made the call for everyone to ‘Get on with it – don’t wait – go implement’, before Better Births was published, we in the MVP/MSLC movement already were, and we responded with renewed energy and enthusiasm. Building on decades of experience. Adapting. Changing. Willing to be ‘new.’ Anticipating being understood, valued, listened to. 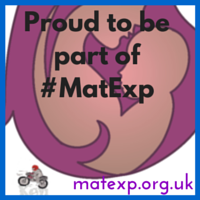 National Maternity Voices (the new name for the ‘England’ group in the well-established forum for MVP/MSLC service user chairs, which provides support and mentoring to MVP/MSLC service user reps too) is about #collaborativeworking – making involvement fun, clearly (quietly but clearly) values-based, sustainable – and truly accessible. I could cite references on the need to broaden involvement, but one would rather be able to continue to focus on just doing it. So, looking forward to clear commissioning guidance that will enable us to do that. This week I’m off to the East Midlands to facilitate implementation of the guidance on setting up Maternity Voices Partnerships. A great blog Catherine that will go on giving for months and months, if not years. And thank you for the plug for my article!